Posted on Thu, Apr 19, 2012 : 5 a.m.
Henry David Thoreau, who worked in many disciplines but is best known for his essay "Civil Disobedience" and his book "Walden," said: "As a single footstep will not make a path on the earth, so a single thought will not make a pathway in the mind. To make a deep physical path, we walk again and again. To make a deep mental path, we must think over and over the kind of thoughts we wish to dominate our lives." At the bridge table, we must think over and over the kinds of thoughts we can use to help make or break a contract. In this deal, East must find the critical play. Against three no-trump, West leads a fourth-highest spade seven. South takes East's jack with his king, plays a club to dummy's ace, and returns a club. What should East discard? When South didn't show a four-card heart suit, North wished he had just jumped to three no-trump. But East should still produce the same play. East should apply the Rule of Eleven to his partner's opening lead. Seven from 11 is four. 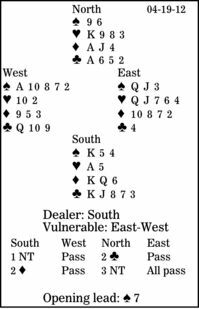 So, there are four spades higher than the seven in the North, East and South hands combined. And East has seen all four: dummy's nine, his jack and queen, and declarer's king. West's suit is ready to run. But West does not know who has the spade queen. If South had begun with K-Q-x of spades, he would have won with the king, hiding the queen. East must make matters clear by discarding the spade queen.